Overlooking Eyre Square, Hotel Meyrick is one of the oldest, finest, and most centrally located hotels in Galway. Locals and visitors to Galway have been meeting and eating at Hotel Meyrick for generations. Hotel Meyrick is now a part of the fabric of vibrant Galway and offers a range of dining options to choose from. Enjoy Afternoon Tea in the Parlour lounge, cocktails and light bites in the stylish Gaslight Bar & Brasserie or opt for dinner in No.15 on the Square restaurant. The Gaslight Bar & Brasserie at Hotel Meyrick is a gorgeous bright, relaxed location, with windows looking out onto Eyre Square. Offering the finest in casual cuisine, the Gaslight provides a little more informality, while maintaining attentive high standards of service. Open daily from 10am till late, with food served from 11am-10pm, The Gaslight offers everything from after work drinks, evening meals, a leisurely brunch experience to lunch with friends or colleagues. With a selection of drinks made to order, the extensive cocktail and wine lists are sure to impress. The food is honest, flavoursome and expertly presented, with a range of dishes available to suit all occasions. Group bookings of friends and colleagues can savour the delicious Sharing Platters, to include the The Turf Board, Irish Cheese Board, The Butcher, The Baker, The Wine & Cheese Maker and The Surf Board, and a delicious bite size selection of scrumptious, signature sandwiches, including the Ate, Marino, and The Pull McCabe, allowing you to sample all that The Gaslight has to offer! The Gaslight is open seven days a week from 11am ‘till late. For further information visit www.hotelmeyrick.ie or call 091 564041. Hotel Meyrick first opened its grand doors to guests in 1852, it was then known as the Railway Hotel. Now iconic to Galway City Centre, Hotel Meyrick is renowned for its central location, style, elegance, hospitality, service, good food and warm welcome. Overlooking Eyre Square, Hotel Meyrick is the perfect location for exploring all that Galway has to offer. Wander the cobbled streets of the city, cruise the River Corrib, take a trip to the stunning landscape of Connemara. Or stay city bound and indulge in some retail therapy, enjoy Afternoon Tea in the hotel lobby or spend some well deserved time in the hotel’s outdoor Canadian Hot Tub and Jacuzzi! Hotel Meyrick, Galway’s most elegant 4 star hotel is located on the very fashionable and central Eyre Square in the heart of the City Centre. Hotel Meyrick combines a stunning Victorian hotel with a superb convenient location, the delights of Galway City are right on the doorstep. The hotel has become a landmark building and the interior design blends classical with contemporary. Named after a section of Eyre Square, once called Meyrick Place. Many notable and historic figures have been welcomed across the threshold, including heads of state, kings, princes, adventurers, soldiers, writers & actors. Guests can choose to make Hotel Meyrick their destination for total escapism while the city of the tribes bubbles along with its lively charm to the back drop of its medieval walls, cobbled streets lined with buskers, artists and of course shopping options. You can choose to explore and become part of the city of fun or simply make Hotel Meyrick your destination for a relaxing break. At Hotel Meyrick, there are 97 luxurious bedrooms ranging from standard rooms, executive rooms, junior suites and executive suites on the exclusive level 5. Many of these rooms have views onto Eyre Square with high ceilings and sash windows. Hotel Meyrick Galway have a range of dining options to suit every mood and taste. Set right in the heart of Galway city, 15 on the Square restaurant, is a beautiful space, broken into a number of inter-connecting rooms with simple and classic design. At No 15, the finest ingredients and culinary skills are combined to produce food that is to be savoured. Following an extensive refurbishment, the lower ground level of the 4 Star Hotel Meyrick has been completely transformed to host No. 15 On the Square Restaurant. Open from 6.30pm each day, No. 15 On the Square promises a warm welcome, friendly and attentive service in an intimate atmosphere, where guests can see firsthand that the food crafted by expertly trained chefs, is the star of the show. With an open plan kitchen and dedicated culinary team, guests will encounter an energetic yet peaceful ambience where food is prepared with passion and commitment which is inspired by Galway. No 15 on the Square’s focus will be on modern high quality food, with regularly refreshed menus which evolve with food trends, while keeping classic favourites at its core. Offering a contemporary, yet relaxed dining experience, No. 15 On the Square’s A La Carte menu is comprised of deliciously simple dishes. Hotel Meyrick has stood tall over Galway’s Eyre Square for over 160 years, securing its position as one of the city’s most iconic hotels. A luxurious 4 Star property; Steeped in history, charm and romance; the Victorian Hotel Meyrick is an ideal wedding venue for anyone looking for the perfect mix of quality, elegance and romance in the heart of Galway City. The hotel is also a licensed Civil Ceremony Venue. Always promising a warm welcome, the Hotel Meyrick prides itself on its most valuable asset- its staff. Boasting the highest standards of quality and service from a long established and loyal hospitality team, who offer everything and more that you would expect from a 4 star property. Hotel Meyrick ‘s experienced staff are always on hand to help brides and grooms planning their perfect day, paying the utmost attention to detail, offering advice and guidance and of course listening to their needs with a warm, friendly smile. On discussing your big day with Hotel Meyrick’s experienced wedding co-ordinators, you will realize the teams’ unrivalled knowledge when it comes to dining, entertainment and the finer touches which will make your day extra special. The dedication of the team promises to ensure an easy and enjoyable wedding planning experience. Hotel Meyrick holds an excellent reputation for quality food and service. Your guests will be treated to the very finest of dishes, comprised of fresh, locally sourced produce, ensuring every wedding day is guaranteed to be a memorable occasion. Hotel Meyrick offers a dedicated venue for each part of your special day, from the warm, welcoming ambience of the Parlour Lounge, where guests will enjoy a drinks reception on arrival; to the breath-taking Connemara Suite is set against a white backdrop and decorated with magnificently decadent crystal chandeliers and stunning candelabras creating a magical ambience ideal for your special day. With an expertly chosen wine list and fantastic range of cocktails, The Gaslight Bar & Brasserie offers a vibrant, yet relaxed atmosphere, which is ideal for Wedding parties and get togethers. The large windows offer fantastic views of Eyre Square, with an abundance of natural light, ideal for a pre-wedding tipple and is transformed by night for post-wedding celebrations when the soft toned lighting creates a laid back, stylish ambience. An ideal location for pre wedding get-togethers, rehearsal dinners and relaxed parties for you and your guests to meet the day after the wedding. For a full overview of Hotel Meyrick’s Wedding service check out their Wedding Video, here. 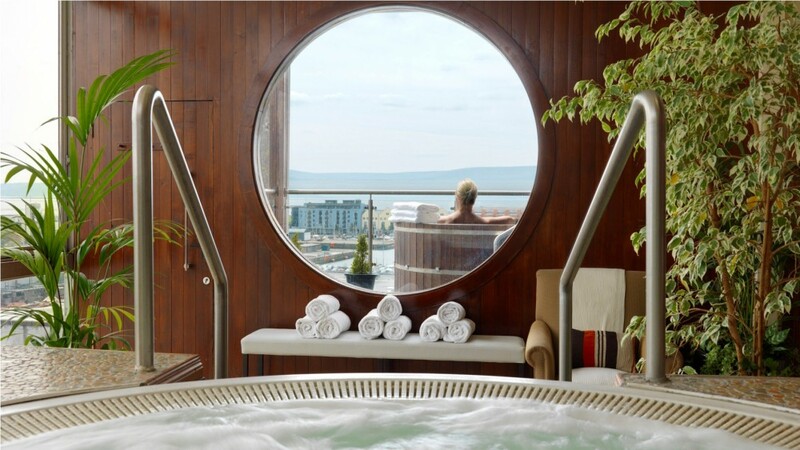 If you fancy a bit of relaxation you can soothe away your stresses at Galway’s most refined hotel spa retreat.All guests at Hotel Meyrick have complimentary use of the Spa & Leisure facilities locatedon the 5th floor overlooking the city. Once you enter the Spa, the team of expertly trained therapists will guide you through the spa’s facilities, the range of exquisite Spa Treatments and their exclusive Spa Packages allowing you to restore your body’s natural beauty. The facilities include a fitness suite for getting in that all important work out, not to mention a steam room, a Jacuzzi and outdoor Canadian hot tub, from which you may look right out over the Galway Skyline, unwind & relax.